I need some assistance identifying the below Ron 26 torpedo tubes that were used with the squadron's initial Mk8 torpedo setup. These seem to have been an upgrade from the earlier MK 18 tubes with the torsion bars. The Ron 26 boats (PT255-264) carried 4 and differed from the earlier Huckins (PT95-102) which carried just two Mk 18 tubes and 8 depth charges (PT255 and 256 originally had this same setup including the 50 cal deflector shields but were fully upgraded shortly after commissioning). All the Ron 26 boats were eventually upgraded to 4 torp racks (some within weeks of commissioning) and had SO radars before leaving Florida. PT 257 (pictured) and PT 258 were the last of the squadron boats to be upgraded to Mk1 racks in Feb 44 (Pearl Harbor). Notice the unusual vent on the side of the pilot house, these were only on the Ron 26 Huckins. Thanks for your assistance! Any pointers to tube drawings would be appreciated. To help in the ID, in the original PT Boats In Action you can see the same tubes on Page 18 - PT 196 photo, Page 20 - PT 333 photo, and Page 21 - PT 362 photo. It has some features of the Mark 18 Mod 5 tube but it doesn't quite match the drawings. I have a photo of PT 196 with maybe the Mod 5 tube, it looks different than the image you posted. It shows a rib on either side of the mounts. Its Huckins PT 257 RON 26 and from the small amount of background I can see, she looks like she is moored to a anchor buoy at Toboga Island, Panama. Ted, wait a minute! Are you saying that there were other PT boats BESIDES Elcos? I am not sure I believe that one my friend! 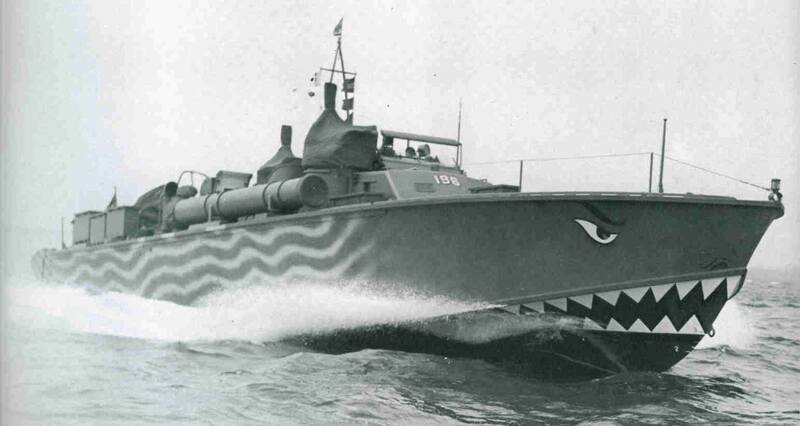 I thought that PT109 was the only PT boat that was ever built! Can you tell that I am kidding yet? I'm thinking these were on the Elco boats for just a short period of time as an upgrade to the Mk18 tubes. This is a WAG, but (with the exception of the first batch of Ron 26 boats) they were probably all upgraded to the Mk1 racks stateside by about Sep-Oct 43. The original photo is PT 257 in Taboga Island about Sep-Oct 43 when she and PT 258 were temporarily assigned to Ron 14 and the Panama Frontier, providing ready boat, patrols, and training. They stayed gray during their few months, and did not receive the Ron 14 Measure 31/5P scheme. The other boats in the Ron26A batch had shipped to Hawaii and would be the first Ron 26 boats stationed at Pearl City. Eventually these same four were shipped to Midway to replace the 77' Elcos. PT 257 and PT 258 would ship to Hawaii with the Ron26B batch on Christmas Eve 43. The tube in the color image of PT 333 you posted, and the image of PT 196 I posted, is maybe a Mark 18 Mod 5 Andy, and not the same as the one in your Huckins photo or the photo of PT 362 I posted. The ribs around the tube are different. To quote the infamous Ted Walther: "Higgins, the box an Elco comes in.". You are most correct! Missed that. The mounts are the same but the ones on the Huckins have 3 bands and not the four. As you mentioned, the photo of PT 362 does have the exact same ones. Probably the next and final version developed for the Elcos?